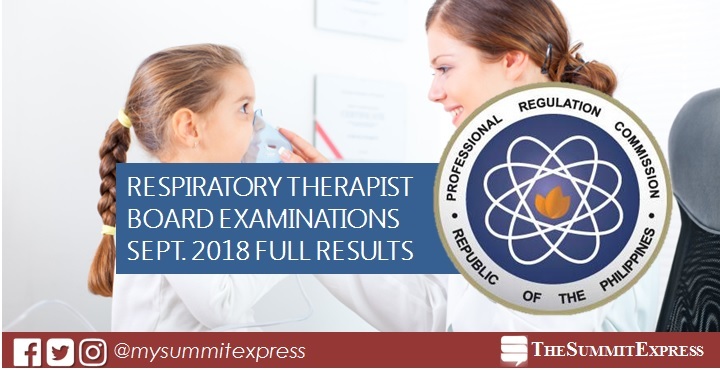 MANILA, Philippines – The September 2018 Respiratory Therapist (RT) board exam results to include the list of passers, topnotchers (top 10), top performing schools and performance of schools are released online on Monday, September 10, 2018 or in two (2) working days after the exam. The Professional Regulation Commission (PRC) and the Board of Respiratory Therapy administered the licensure exam in the cities of Manila, Baguio, Cebu, Davao and Zamboanga on September 5 and 6, 2018. From September 20 to September 24, 2018, registration for the issuance of Professional Identification Card (ID) and Certificate of Registration will be done on-line. Please go to www.prc.gov.ph and follow instructions for initial registration. Respiratory Therapist board exam verification of ratings (passers, non-passers and removal) can be done online. Visit PRC's "Verification of Rating" service and enter the required information to verify your identity. Note that this can be available in few days after the exam. The September 2018 Respiratory Therapist board exams covered topics from Diagnostics (25%), Pathophysiology (25%), Respiratory Care (25%) and Neonatal and Pediatric Care (25%). According to PRC Resolution No. 2017-1068, the target release date of Respiratory Therapist board exam results is on Monday, September 10, 2018 or in two (2) working days after the exam. In the same period last year, results were announced by PRC in just one (1) working day. A total of 597 out of 974 passed the exams. Cagayan State University (CSU) -Andrews Campus topped the schools with 96.49% passing rate or 55 out of 57 passed. Alma Cera Castro, also from CSU, aced the board with 88.75%. In the September 2016 exams, results were out online also in 1 working day. PRC named 582 out of 818 who passed the tests. Cebu Doctors' University (CDU) was the top performing school with 100% passing rate or 51 takers passed. Ruth Cuyam-an Sacla of Pines City College (PCEC) led the passers with 89.00%.